To a gravy of beef (good and strong) I opine, You'll be right if you add half a pint of port wine: Pour this through the Swan - yes, quite through the belly, Then serve the whole up with some hot currant jelly add eight quarts of water, directly it boils place it at the corner of the stove, scald the giblets in boiling water, take them out and cut them into joints, the gizzard in four pieces, put them into the stock, and let them simmer gently until they are quite tender, take them out, strain the gravy through a cloth, skim off every particle of grease, put it into a clean stewpan with the giblets, and thicken it with arrowroot dissolved first in cold water, but do not make it too thick; finish by adding half a pint of sherry, the juice of half a lemon, and two grains of cayenne. Boil some large cooking apples till quite tender, add to them nutmeg and cloves; beat them up to a pulp, with enough powdered sugar to sweeten them, squeeze over them the juice of a lemon, pour over them part or the whole of a bottle of sherry as required, with a wineglass of brandy; beat well together, and serve in a glass dish. 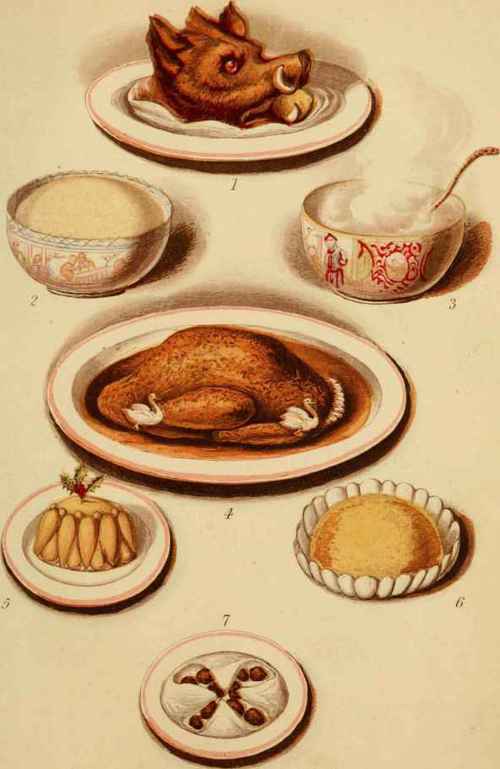 Or, Take a quart of milk and half a pint of sherry, make a nice white wine whey with it; roast some crab apples, drop them in the whey, and send up hot in a china bowl. Furmity, probably originally Frumenty, from frumentum, the Latin for wheat, is one of our oldest Christmas dishes. It is made of wheat, milk, wine, or brandy, and plums, thus: - Put a quarter of a pound of wheat into a saucepan with two pints of milk, and boil it until it is swollen, but not broken; then add a quart of new milk, two ounces of raisins, two ounces of currants, and sugar to taste; flavour with cinnamon, and boil it for a quarter of an hour; then stir in a wineglass of good brandy or two wineglasses of sherry (the last is best), and serve. Three lemons, half a pint of rum, half a pint of brandy, sugar to taste, two quarts of boiling water. Peel the lemons as thin as possible, pour half a pint of boiling water over them, and cover them closely; let them stand till the essence is thoroughly drawn out of the lemon peel; put the whole (water and lemon peel) into a very large jug, add the rum, brandy, and the juice of two lemons, and sugar; pour boiling water on it till it is of the strength you require; strain it into a china bowl and serve. If it is wished to be drunk cold it must stand before sending up. Steam the bowl before the punch is poured into it hot or it will, in frosty weather, crack. Punch can be made with the rum alone; it is then much cheaper. Two ounces of isinglass, one pint and a half of water, two large lemons, two pounds of loaf sugar, two large wineglasses of brandy, the same of rum. Peel one lemon, put it with the isinglass into the water, and dissolve the isinglass; put the juice of the lemons and two pounds of loaf sugar to the two wineglasses of brandy and the rum; strain the isinglass water upon the lemon juice and spirits; place it over the fire to become hot, but do not let it boil; let it stand a few minutes to settle, strain it through a fine hair sieve into the mould; stand it in a very cold place, at Christmas it will not require ice to harden it; shake it the next day gently into a glass dish; stick a little spray of holly in tin; top. Lemon Cream. Cruet Stand. Potato Balls. Blancmange. Cold Fowls. Veal cutlets. Tea. Strawberries. Cold Cutlets. Cold Fowl and Tongue. Cake. Pigeon pie. Lobster Salad. Tartlets. Lemon Cake. Sweet Biscuits.